Did they plan this for a long time or did they just do it on a lark? The M logo. That is excellent. While I certainly don't approve of a helmet-top logo in general, this clever design appears like a wing when viewed from the side. So I'd say that its use on the helmet is very good. I think the helmet is very sharp. Shows great flexibility from the logo that it's simple but can be used in a lot of ways. A much more successful modern helmet than Jacksonville. It’s not common to see a team brand designed with this type of approach. Take away the helmet, pennant, and other sports paraphernalia, and this could be a store, a fashion label, a restaurant/bar, an agency, etc. They might not be the first team to approach branding like this, but they might be the first to go all in on it, and I think there is a lot of success here. The uniforms are the most underwhelming piece compared to the rest of the work. I’m admittedly sad to see the iconic blue-white-red jersey design go away, but the brand extensions and the helmet are, in my opinion, the pieces that are going to live on and challenge the status quo of team branding into the future. The helmet, in particular, is really interesting in the way it gives you such a unique look from different angles (wings from the side, M from the front), while the logo itself straddles a nice line between monogram and bird. I hope they eventually get the perfect threads to complement the rest, but I’ve gotta hand it to the people who worked on this one; you’ve got the building blocks of something special here. 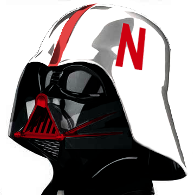 GEE You made me realize theres an M on the front of the helmet! So you got a bird on top, wings on side and a M on the front of the helmet! I mean, hey, those guys and gals who created this are cool people, this thing rocks. Overall, a very nice look. I love the helmets. The CFL has never had a helmet that featured wings or horns like the Eagles, Vikings and Rams in the NFL. The M logo on the the top gives the helmet "wings" on the sides like the Eagles. 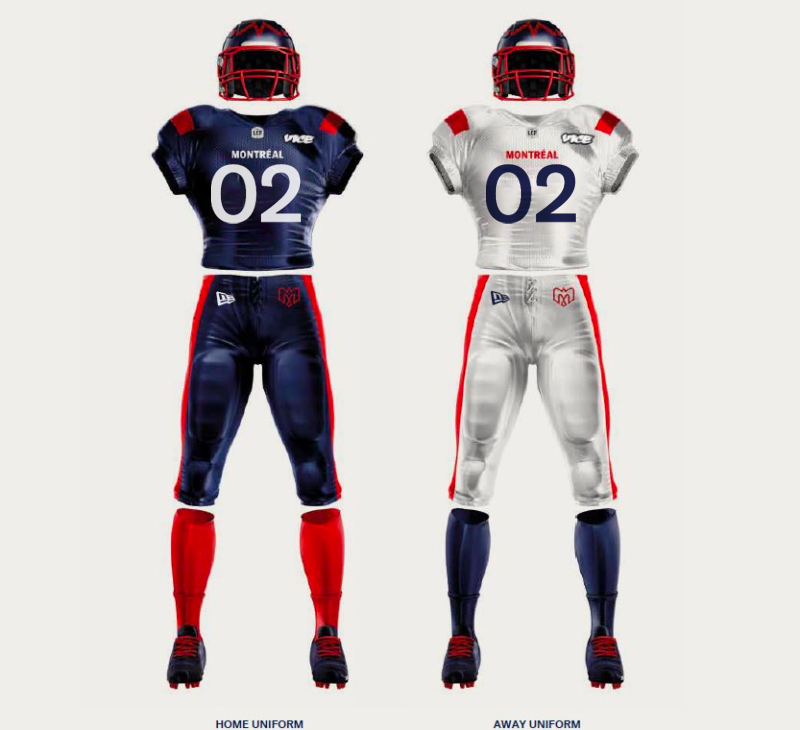 The bright red on navy doesn't get muddied up and the red facemasks make the look distinctive. 1) Enough with the monochrome looks. Blue jersey/white pants at home, white jersey/blue pants on the road. 2) The blue numbers on the white jerseys should also have a red border. 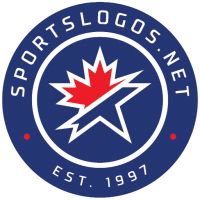 Favourite Logos:Detroit Red Wings (current and the classic "reversed" version).<br /> <br /> Toronto Argonauts 1977-88 "boat" logo. The CFL has never had a helmet that featured wings or horns like the Eagles, Vikings and Rams in the NFL. The M logo on the the top gives the helmet "wings" on the sides like the Eagles. Paulwoods beat me to it. They also used them last year as part of their historical series. the really interesting thing will be to see how the whole identity develops over time, because it is so of the moment and trendy. whats the next step for them? 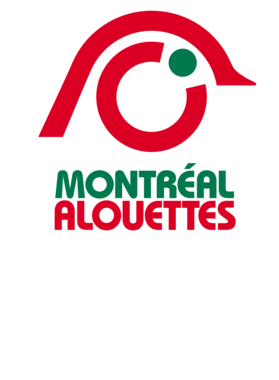 This identity is so good it made me a Montreal Alouettes fan. Good think I've been to Montreal twice. Interesting to see around the 4:35 mark that they switched from red numbers on blue to white numbers on blue (visibility concerns?) and even seem to have taken promo photos of both versions. That video is very impressive and has set the standard for what all the other CFL teams should do when they get their new unis in 2020. French-canadian airbnb. "My friends just booked a quaint chalet at mont-tremblant and had a fabulous holiday. 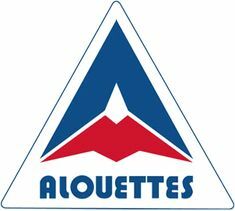 Download Alouettes today." They should do an icebucket challenge...cuz, you know, ALS. exactly the same contemporary design language...despite being a nice logo it will not age well. This logo has far more of a connection with traditional design language (like something created between 1965-1985) than anything exclusively modern. The only part of this rebrand I'm not entirely buying is the block numerals on the uniforms. It doesn't really match anything else in the brand. I think a one color treatment of GT America Medium or Bold numerals would have pushed this entire concept a little bit further. Yeah this logo feels simultaneously very retro and very modern, which is damn near impossible to pull off.